1910 E90-3 American Caramel Jimmy Sheckard PSA EX-MT 6 - Highest Graded! 1910 E96 Philadelphia Caramel Nap Lajoie PSA EX-MT 6 - Highest Graded! 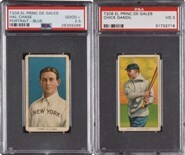 1909-1911 T206 White Border Frank "Home Run" Baker PSA EX-MT+ 6.5 - Sovereign 350 Back - Highest Graded! 1909-1911 T206 White Border Ty Cobb Portrait Red Background - Cycle 460 Back! 1909-1911 T206 White Border Clark Griffith Batting - Cycle 460 Back! 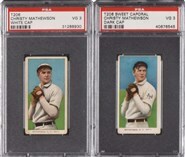 1909-1911 T206 White Border Tris Speaker SGC NM 84 - Highest Graded!